Thanksgiving Answers From Chris Kimball When it's time to make the Thanksgiving meal, most cooks rely on time-tested recipes and a bullet-proof checklist — to make sure it's all done on time. Chef Chris Kimball of America's Test Kitchen answers questions from our readers about how to make a meal memorable — for the right reasons. Man With A Plan: For moist, flavorful dressing, Chris Kimball recommends cooking the turkey over it, in a broiling pan. When it's time to make the Thanksgiving meal, most cooks rely on time-tested recipes and a bulletproof checklist — to make sure it's all done on time. In a brief pause from his duties at America's Test Kitchen, Chef Chris Kimball answered some of the questions our readers have sent in about how to make everything taste great for Thanksgiving. If you don't see an answer to your question here, don't despair — Morning Edition's Steve Inskeep and Renee Montagne took advantage of a recent morning spent with Chris to ask him questions pulled from our Web site. The recipes Chris shares are at the bottom of this page — or you can visit our Recipe Share page. I was wondering about the process of salting (not brining). They used this to make the most amazing chicken at Zuni Cafe in California (I can vouch for this), and Bon Appetit is promoting it this year, but I am concerned as some comments say it is too salty. Any opinion would be helpful. Chris Kimball: Yes, I actually got the idea for salting from Zuni, and we did a recipe for salted turkey back in 2006. Overall, I slightly prefer brining because I find the meat to be slightly juicier, and the recipe is also a bit fussier as well — we use ice packs to chill down the breast meat so it does not overcook. In any case, here is the recipe. Can I inject the brine liquid in the turkey????? CPK: Yes, but it is less work to simply let the bird sit in the chilled, salted water overnight. My father recently had bypass surgery, and we're having to cut back on sodium. We really enjoy a brined turkey, but that's not an option for us now. What are our other options for a moist, flavorful turkey? CPK: The best way to get a juicy bird without brining (be careful of many frozen turkeys at the supermarket — they are injected with a flavored saline solution, which raises the salt level — frozen Butterballs have been injected, for example) is to roast turkey parts at a lower oven temperature. Use a whole skin-on bone-in turkey breast and then 4 pounds of thighs and drumsticks. Roast at 275 degrees for 2 to 3 hours or until done. The breast meat can be taken out of the oven before the dark meat so it is not overcooked, and the lower oven temperature will keep the meat juicy. I once read an article in praise of brining in the San Francisco Chronicle. The author said that if you cannot fit the turkey and brine solution in the bin at the bottom of refrigerator, you can put it in a garbage bag (or two). Problem is that every brand of garbage bag I could find said it was not to be used for food. I even called all the manufacturers and none made a single food-grade product. Do you have any suggestions on how to brine a turkey that doesn't fit in the fridge bin? CPK: Yes. Put the turkey and the brine into a large beer or picnic cooler. Use frozen reusable ice packs to keep the liquid cold. Hello, will you please consider including ideas/recipes for a great vegetarian Thanksgiving — not only for those of us who are vegetarians, but for those of us who have guests coming who are. And, of course, to save a bunch of turkeys! Thank you. CPK: There are endless possibilities here for main courses other than turkeys, and I wouldn't try to replicate a turkey by using, for example, tofu. The best bet is probably a vegetable lasagna or similar casserole-style dish. Do you have any tips for a vegetarian Thanksgiving? I'm eating with the omnivores next month, and I'd like to bring some vegetarian dishes to share! CPK: Most Thanksgiving side dishes are de facto vegetarian, but here is my favorite side dish — mashed sweet potatoes. It uses a stovetop method that delivers fabulous flavor, and it's easy to boot. I always struggle with the timing of dishes. Can you give a primer about making your menu arrive in a coordinated and timely manner? CPK: Sure. Focus on the oven, since that is the limiting factor for a meal that includes roast turkey, casseroles and pies. But I would suggest starting even earlier on, even a week or more before Thanksgiving, to sort out purchasing pantry staples versus fresh ingredients that require last-minute purchases, defrosting the turkey (about 5 pounds per day), dealing with timing for homemade yeast bread, figuring out which recipes can be prepared all or in part the day before, etc. I would also look at which recipes can be made on the stovetop versus the oven — this would be key in a kitchen with only one oven. 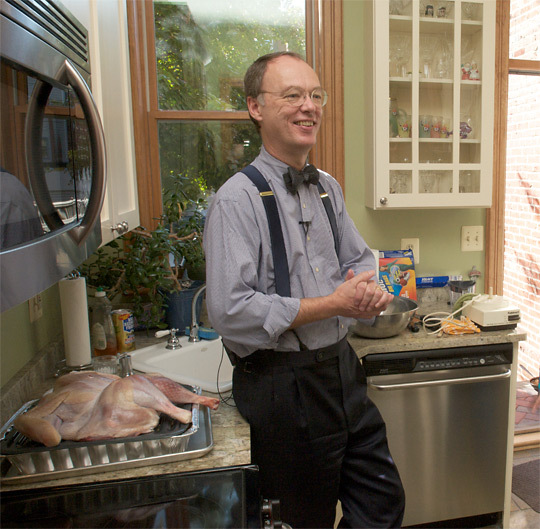 This question for Chris Kimball is posed with all respect (it's hard to capture tone in a brief comment box): Between the magazine, the television show and interviews on radio on Thanksgiving morning, would you honestly reveal the last time you cooked an entire Thanksgiving dinner for guests? And what did you choose to serve from all the options available to someone with your cooking experience? CPK: I actually cook Thanksgiving every year for our family of six, and usually another six guests. I roast the turkey in a wood cookstove, make my own turkey stock with the neck and giblets, our own mashed potatoes, bake three pies (apple, pecan and pumpkin) and make an English trifle. My wife, Adrienne, prepares Brussels sprouts, homemade Parker House rolls, sweet potatoes Georgian (a local Vermont recipe — a baked casserole), creamed onions and a cornbread/sausage dressing. Our 18-year-old daughter Caroline helps with some of the baking — she is working at a local Vermont bakery this year — but the rest of the kids are on cleanup duty. The next day, we get up early to go deer hunting, as the season always closes the Sunday after Thanksgiving. Cutting the sweet potatoes into slices of even thickness is important in getting them to cook at the same rate. A potato masher will yield slightly lumpy sweet potatoes; a food mill will make a perfectly smooth puree. The potatoes are best served immediately, but they can be covered tightly with plastic wrap and kept relatively hot for 30 minutes. This recipe can be doubled in a Dutch oven; the cooking time will need to be doubled as well. 1. Combine butter, cream, salt, sugar, and sweet potatoes in 3 to 4 quart saucepan; cook, covered, over low heat, stirring occasionally, until potatoes fall apart when poked with fork, 35 to 45 minutes. 2. Off heat, mash sweet potatoes in saucepan with potato masher, or transfer mixture to hopper of food mill and process into warmed serving bowl. Stir in pepper, maple syrup, and orange zest; serve immediately. This recipe was developed and tested using Diamond Crystal Kosher Salt. If you have Morton's Kosher Salt, which is denser than Diamond Crystal, use only 4 1/2 teaspoons of salt in the cavity, 2 1/4 teaspoons of salt per each half of the breast, and 1 teaspoon of salt per leg. Table salt is too fine and not recommended for this recipe. If you are roasting a kosher or self-basting turkey (such as a frozen Butterball), do not salt it; it already contains a good amount of sodium. 1. Using a wooden spoon and/or your hand, carefully separate turkey skin from meat on breast, legs, thighs, and back; avoid breaking skin. Rub 2 tablespoons salt evenly inside cavity of turkey, 1 tablespoon salt under skin of each breast half, and 1 1/2 teaspoons salt under skin of each leg. Wrap turkey tightly with plastic wrap; refrigerate 24 to 48 hours. 2. Remove turkey from refrigerator. Rinse off excess salt between meat and skin and in cavity, then pat dry inside and out with paper towels. Add ice to two 1-gallon zipper-lock bags until each is half full. Place bags in large roasting pan and lay turkey breast side down on top of ice. Add ice to two 1-quart zipper-lock bags until each is one-third full; place one bag ice in cavity of turkey and other bag in neck cavity. (Make sure that ice touches breast only, not thighs or legs.) Keep turkey on ice for 1 hour (roasting pan should remain on counter). 3. Meanwhile, adjust oven rack to lowest position and heat oven to 425 degrees. Line large V-rack with heavy-duty foil and use paring knife or skewer to poke 20 to 30 holes in foil. 4. Remove turkey from ice and pat dry with paper towels (discard ice). Tuck tips of drumsticks into skin at tail to secure and tuck wingtips behind back. Brush turkey breast with 2 tablespoons butter. Set prepared V-rack in roasting pan; set turkey breast side down on V-rack; brush back and legs with remaining 2 tablespoons butter. Roast for 45 minutes. 5. Remove roasting pan with turkey from oven (close oven door to retain oven heat); reduce oven temperature to 325 degrees. Using clean potholders or kitchen towels, rotate turkey breast side up; continue to roast until thickest part of breast registers 160 degrees and thickest part of thigh registers 170 to 175 degrees on instant-read thermometer, 1 to 1 1/2 hours longer. Transfer turkey to carving board; let rest 30 minutes. Carve and serve. Serves 10 to 12. Published November 1, 2006.